Brent Roberts decided to remember his aunt in a very special way. 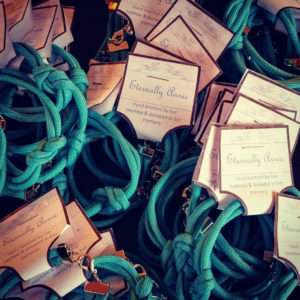 Brent chose to hand make teal infinity knot bracelets and donate all funds to T.E.A.L.®. Brent is very familiar with T.E.A.L.® since he and his family has been walking in honor and remembrance of his late aunt Annie on Team Annie at our Brooklyn T.E.A.L.® Walk/Runs. 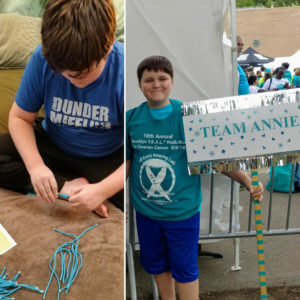 Team Annie has done amazing things for T.E.A.L.®, holding an annual fundraiser each year raising thousands of dollars, visit https://tealwalk.org/news/ to read more about these amazing events. Thank you to Brent and the rest of Annie’s family for supporting T.E.A.L.®! For my social justice project, my mom and I decided to do infinity knot bracelets and to donate them in my Aunt Annie’s name to help the T.E.A.L. 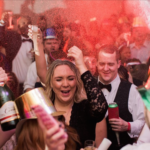 organization raise money. For many years I have been doing a charity walk for an organization called T.E.A.L. (Tell Every Amazing Lady). The walk is for the fight against ovarian cancer. I do it in honor of my Aunt Annie who passed away of ovarian cancer about four and a half years ago. It was a big tragedy in my family and was only a few years after my grandpa passed away. For many years I have been honoring her by doing the T.E.A.L. walk as well as other walks against cancer in her honor. I’ve also donated my birthday money to the organization and today I’m wearing one of the infinity knot bracelets that I made. 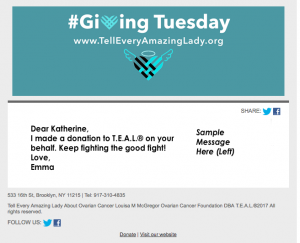 I started walking for T.E.A.L. even before my aunt died to support her in her fight against ovarian cancer and we continue to walk because my aunt asked my mom to keep going with our team. When we walked after the first 6 months of her passing our team raised the most money for T.E.A.L. and even though we won a prize it is walking in Annie’s memory that really matters. 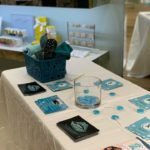 Even after my service project I will keep on walking year, after year, after year to honor my aunt and honor everybody who’s passed away from ovarian cancer.